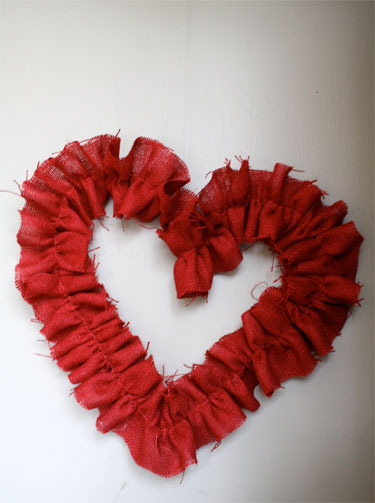 Dress up your home with a super easy to make burlap heart wreath. Not only is the wreath simple to make it is cheap! 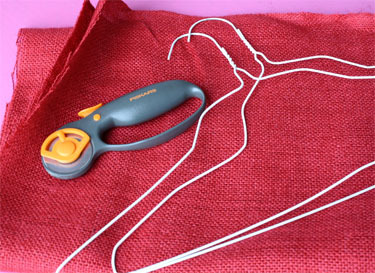 Inexpensive burlap and a wire coat hanger are all it takes. 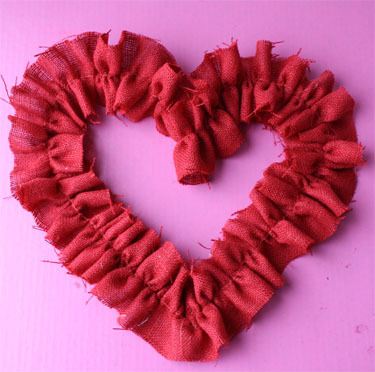 Once you have made a Valentine’s wreath try making this burlap wreath. Folding the burlap makes a cool look. I have a double front door and need two door decorations and wanted something inexpensive. When I saw this red burlap on sale this week at Hobby Lobby for $1.99 a yard I decided the price was right. I realized for less than two dollars I could make two wreaths. You could use burlap ribbon instead of cutting your own strips. I have also seen heart shaped wreath form. Another option if you don’t have a wire hanger you could use heavyweight floral wire. Cut 3 – 4″ X about 50″ burlap strips. Sew these three pieces together, so you have one long strip. 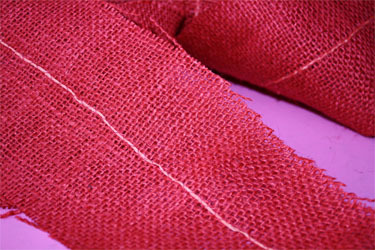 To gather the burlap, machine zig-zag stitch over dental floss. I used red cinnamon flavored floss so it wouldn’t show, even though it looks white in the picture. Pull the floss and gather the burlap. 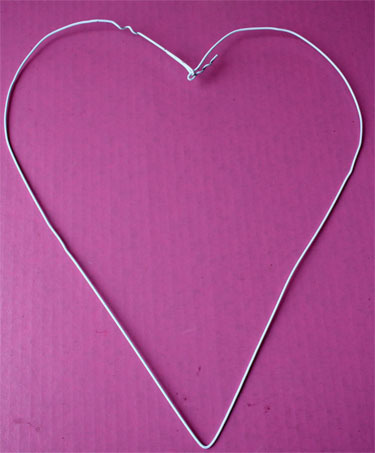 Bend 1 wire hanger into a heart shape. Adjust gathers to fit around the frame, cutting off any extra that isn’t needed. Hot glue to wireframe. I used clear fishing line to hang, but a pretty white bow would be nice. If you want a no sew method, Craftaholics Anonymous gathered the burlap by threading it about every three inches or so right onto the wire Hanger. I love making my home festive for Valentine’s Day! Here are some fun Valentine’s Day Ideas. Here are some fun Valentines decorations if you are having a dinner party. I am partial to hanging hearts and party favors especially when they are easy to make. I finally got mine made this week...I've got to get it posted, but thanks for sharing your idea and the directions to make it work! I love it! this is boring I hate it ALOT! Plus, my tips to make it a little easier! I'm in love! That is absolutely adorable! :) I have to make one now. This is so sweet!!! Thanks for sharing your tutorial. Oh how beautiful! This reminds me of Project runway last night!. =) Thanks so much, I'll be linking. That's the first time I have heard of the gathering technique using a zig zag stitch over floss, genius! Thanks for sharing such a cute design. The burlap gives the hearts such a country look. Can't decide if my favourite is the red or the white. Both are great! too cute! I've never seen red burlap! So stinkin' cute...want one, now. Wondering if it would work with a non-burlap fabric...hmmmm. Thanks! The white wreath on the red door is stunning! 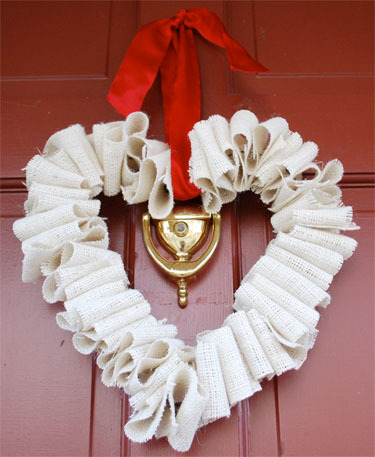 what i love about this wreath is that you used burlap...pretty! Really cute & so simple! I think I need to make one (or maybe a bunch of different sizes & colors) Thanks for posting! o m geee its fabulous! i want to make one too!!! thanks for posting! Eu achei a ideia incrível, com pouco material, faz-se um objeto decorativo tão bonito. HOLY COW! I Love Love Love this! I am amazed! So easy. So cute! I am going to pick my jaw off the ground and get crafting!! I'm lovin' the burlap. And red? Too cute. Have to dig out my burlap from my fall totes and make something. This is so easy and totally awesome looking! Love it, you always have great ideas! Thank you for sharing them with us, you've been an inspiration to my blog as well. Love the wreath! Can't wait to make one myself. Love your version, especially in red. Very stunning!